Add comfort and style to your dining establishment with this Grosfillex US638680 / US739680 Vogue denim blue stackable barstool! Designed for long-lasting use, this barstool features a durable aluminum construction that stays cool to the touch even after being in the sun. Its sturdy resin backrest is contoured for optimal spinal support, while its foot rest helps reduce pressure on guests' legs for maximum comfort. Plus, its armless design allows guests to take a seat from three different directions, making it easier to sit down and adjust to their comfort level. 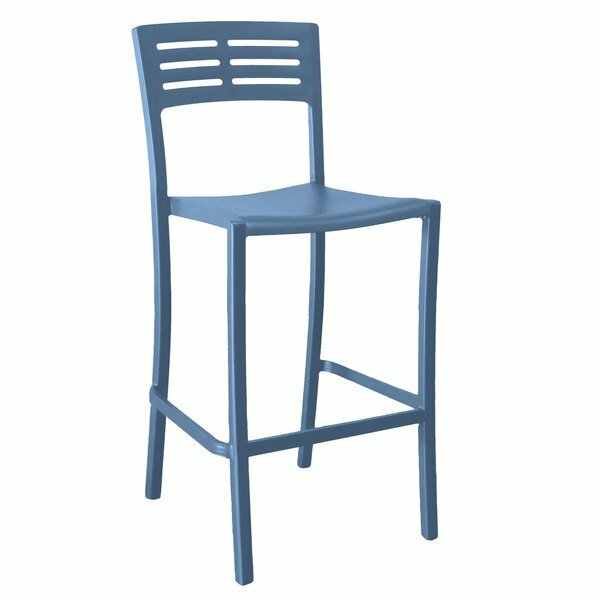 Featuring a modern, slim design, this attractive denim blue barstool provides a distinct visual appeal to any dining area. Plus, its legs are capped with glides to protect your floors from scratches or scuff marks. Boasting an ample 300 lb. capacity, this durable barstool guarantees comfort as guests enjoy your indoor dining area or outdoor patio!